Charter Manager Jaqueline Leigh at Yachting Partners International is offering the sensational 39.95m sailing yacht Rainbow JH2 for charter for the first time. 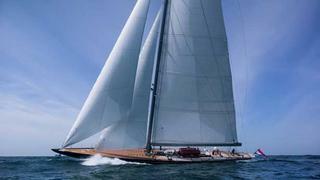 The original J-class Rainbow won the America’s Cup in 1934 and was designed by William Starling Burgess and built by Herreshoff in the USA. Built by Holland Jachtbouw in 2012 in aluminium, this 39.95m Rainbow JH2 replica is based on the original design, with a modern update from Dykstra Naval Architects. Built for an experienced sailing yacht owner, she’s the first J-class yacht with a complete hybrid propulsion and power system. This means fuel savings of up to 30% as well as a reduction in sound. Rainbow JH2 charters at rates from €60,000 per week.